Fellow Vancouverites are, of course, familiar with Science World, an exhibition of scientific paraphernalia in the former Expo Centre which served as a host pavilion for Expo 86, the 1986 World’s Fair. We took our kids there many times when they were young. And when we visited Seattle, we sometimes took them to the Pacific Science Center, a similar venue located just below the Space Needle, and also a legacy of a world’s fair. Both are located smack dab in the centre of their respective cities. 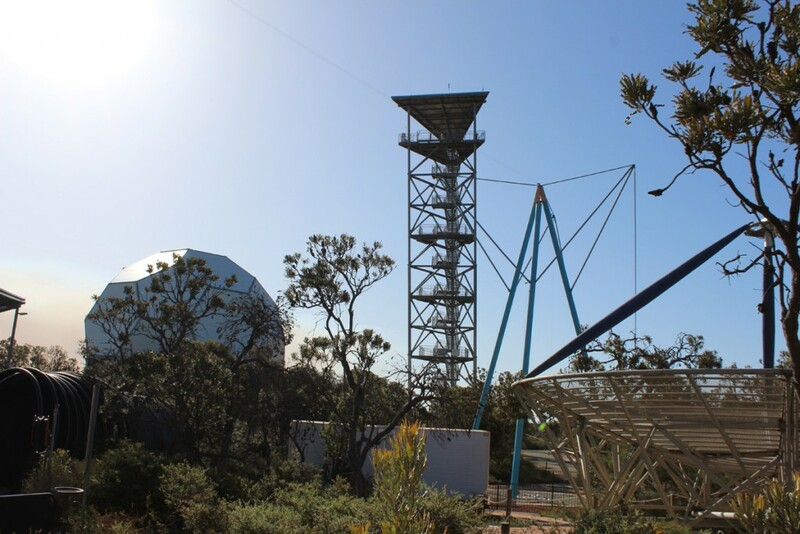 Not so the Gravity Discovery Centre in Western Australia. It is an hour north of Perth smack dab in the middle of nowhere. A large brushfire forced us to an alternate route. Brushfires are fairly common in Australia. 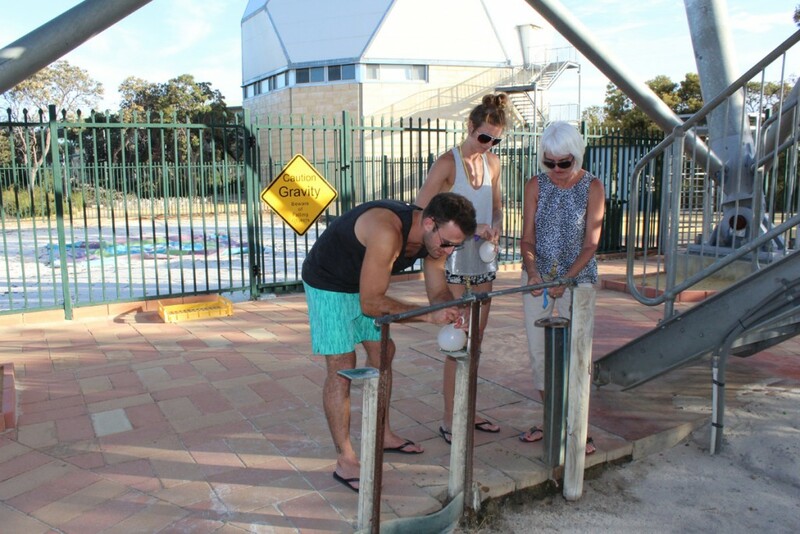 We came across it by accident after a day trip to see the Sand Dunes of Lancelin. 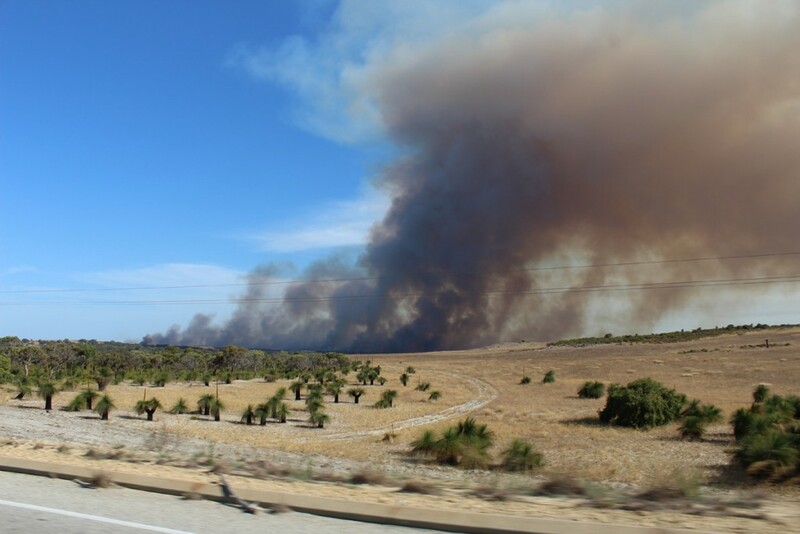 A brushfire we passed on our way there had spread across the coast highway and we were redirected to an inland route. 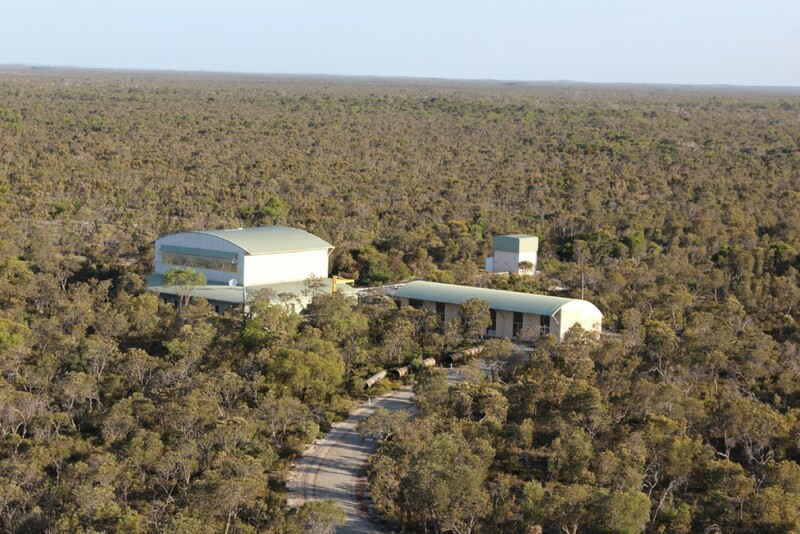 The Gravity Centre is located on the outskirts of the Gnangara-Moore River State Forest just off Military Road. 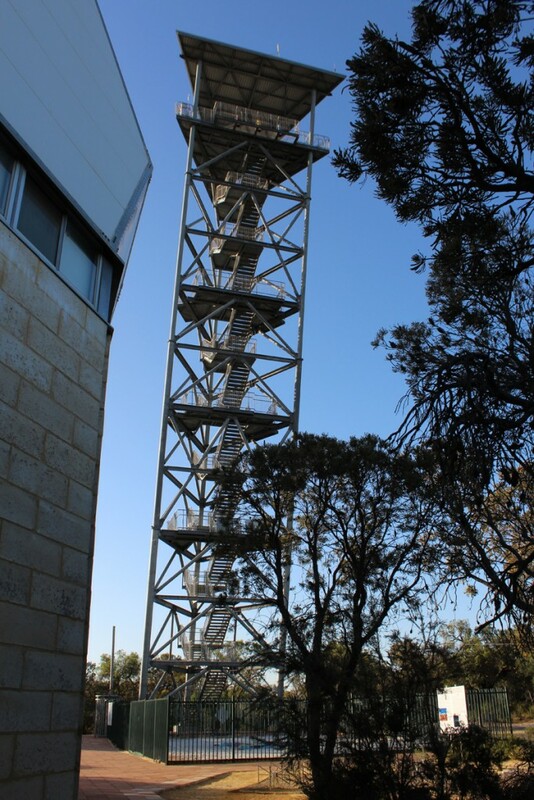 Its most notable feature as you approach is a large thirteen story tower, the Leaning Tower of Gingin (named after a nearby town). This science education centre has a focus on gravity and cosmology. 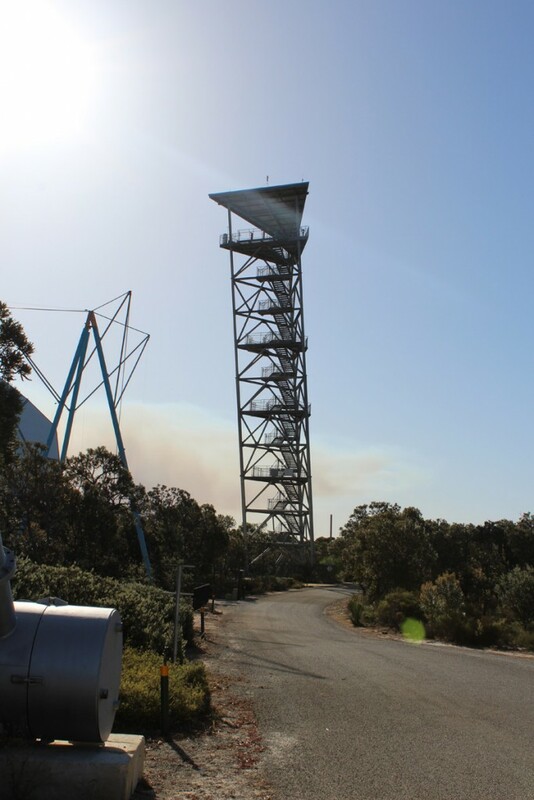 It’s located out here in the toolies because it is on the site of the Australian International Gravitational Observatory. The public centre is operated by the University of Western Australia. The main gallery and visitor centre seen from the Leaning Tower. The main gallery and visitor centre includes a bio-diversity display. 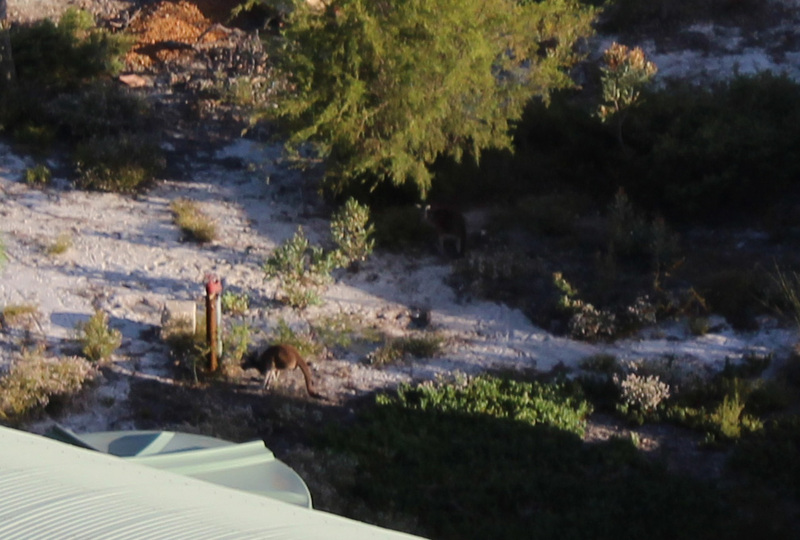 This area of South Western Australia is “one of the 12 richest biodiversity hotspots on the planet” says a sign. The display itself is mainly photos and static displays, but you can walk around outside later to see some of the native vegetation. 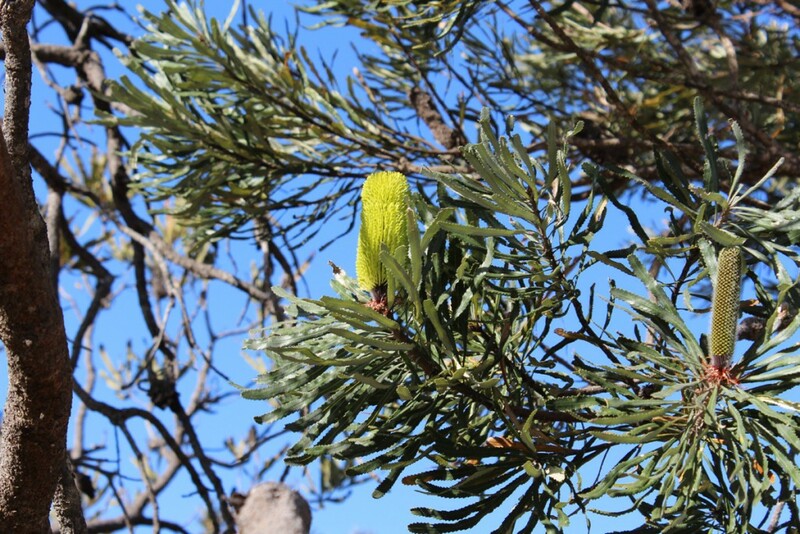 A Candlestick Banksia, one of the many different flora of the area. 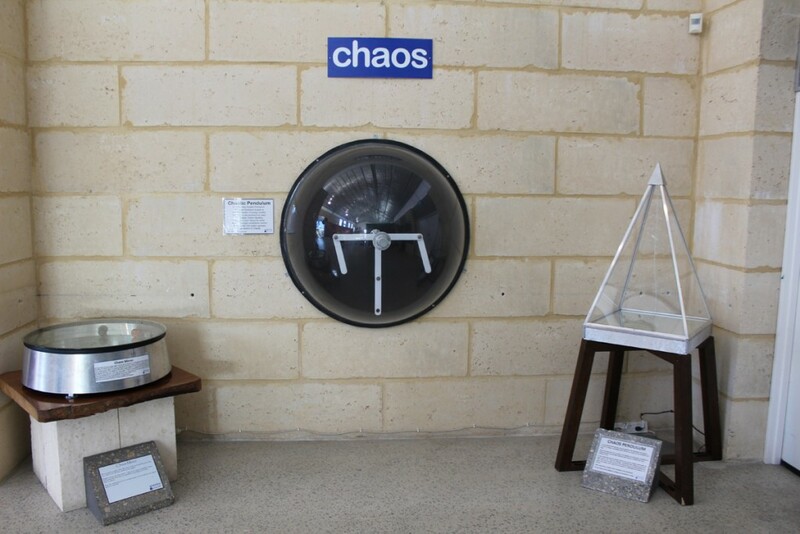 Also in the gallery is a varied display of information on space and gravity, including black holes. 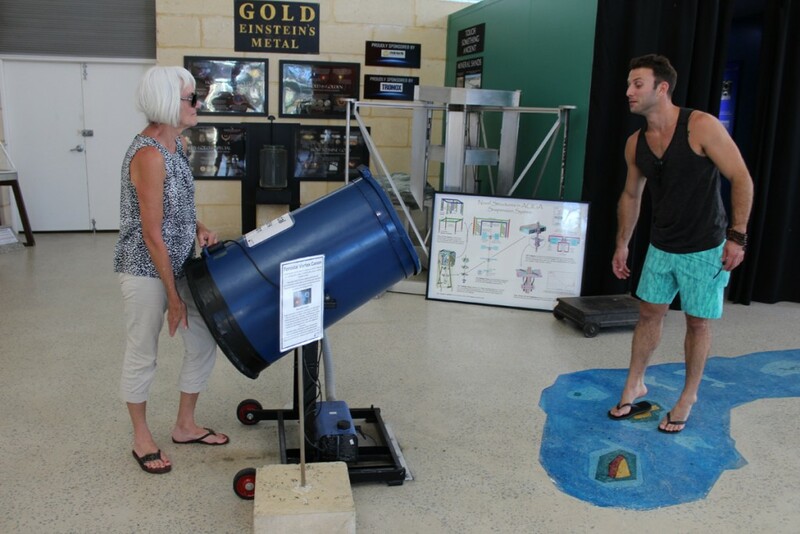 Many of the displays are interactive, fun and educational for kids and adults alike. Janis is about to launch a smoke ring at Jamie with the Toroidal Vortex Cannon. After exploring wave generators, a chaotic pendulum and other exhibits, we left the building and walked through several outdoor displays to a small geodesic dome, the Cosmology Gallery. Here there were a lot o photographic displays but also a 300 kilogram meteorite. The 300 kg. 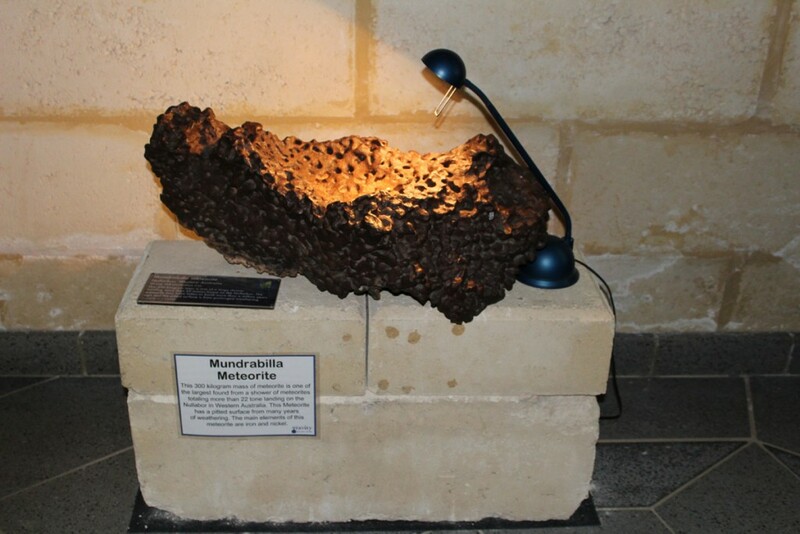 This Mundrabilla Meteorite is one of the largest to have fallen in a meteorite shower in the Nullarbor Plain in Western Australia. 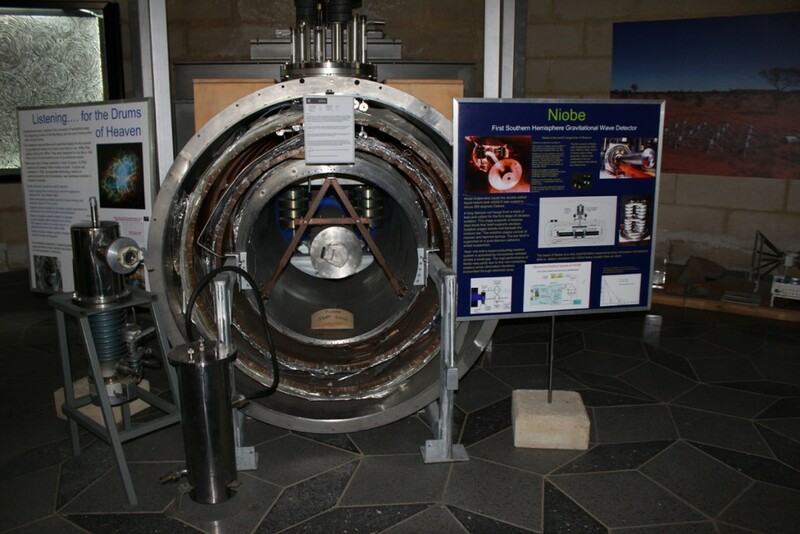 The largest, weighing 9980 kilograms, is at the Western Australia Museum. From there we went on to the Leaning Tower. Inside we had seen a comparison of this tower to the famous one in Pisa. That one is 60 meters high and has an incline of 5.5 degrees. This one is 45 meters high and has a 15 degree incline. Comparison of two leaning towers. 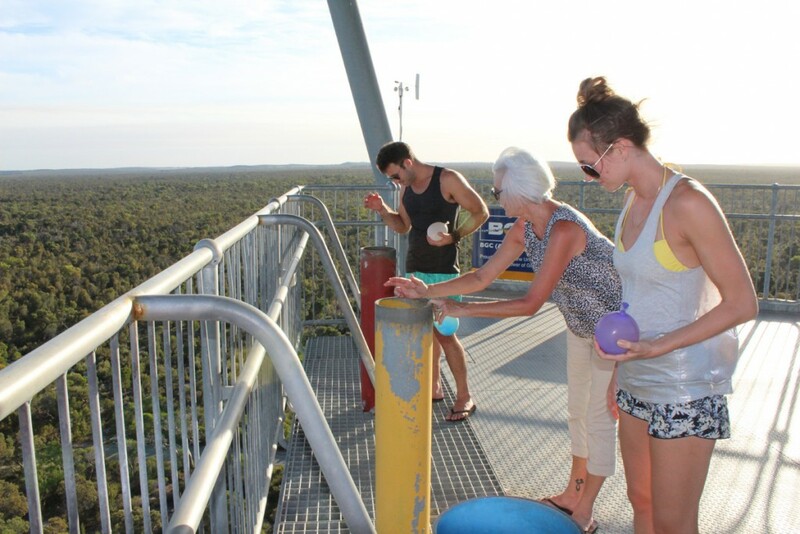 At the bottom of the tower you can fill up balloon with water to take to the top and drop. Then there’s the long climb up – thirteen stories – all stairs – no elevator. From the top you can drop them through tubes and watch through a grilled floor as they hit the splash zone. The tower is a metal superstructure that is open all around, much like the Eiffel Tower, though it has no elevator. At the top you can see for miles in every direction. It is quite exhilarating to stand at the top of the world in the middle of wilderness all around. Admission to the Discovery Centre is modest at $20 for an adult and $13.50 for a child from 10 Am to 4 PM Tuesday to Sunday. There are also evening hours from 7:30 to 9:30 PM Friday and Saturday, but the price is more than double. 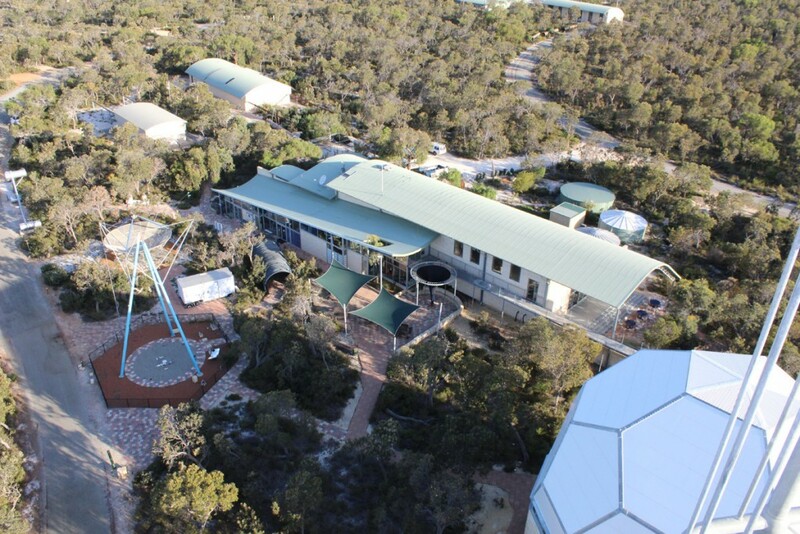 We enjoyed our visit and if you’re heading west to Lancelin or to see the Pinnacles, the Discovery Centre is a nice addition to round out your trip on the way home. 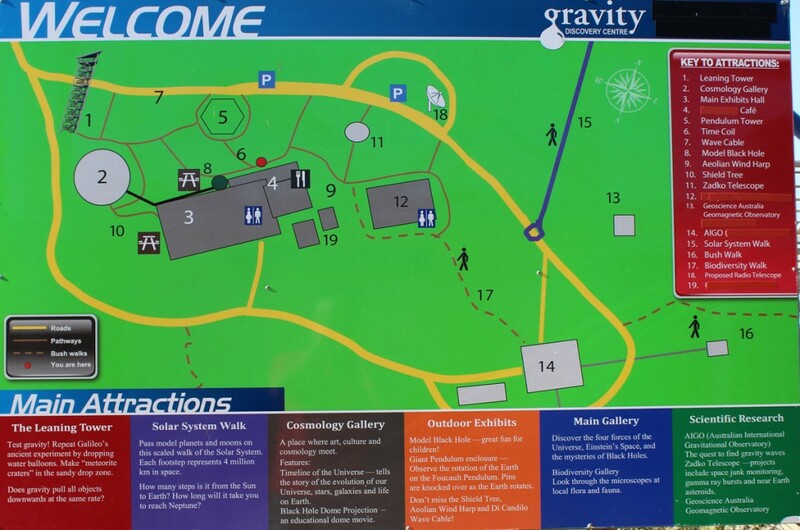 Below is a link to the Gravity Discovery Centre, followed by a map and some additional photos. Map of the centre and a description of the displays. 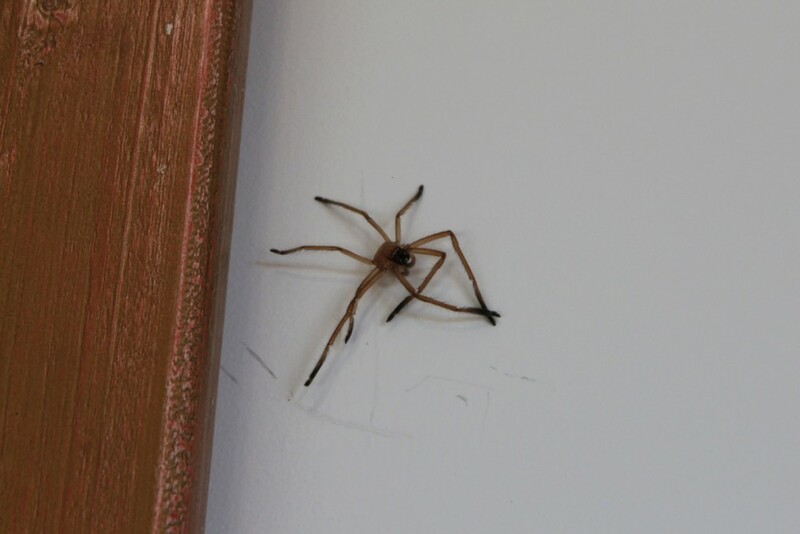 We saw this Huntsman Spider on one of the walls. The Hunstman is the largest spider in Australia and while poisonous, is not considered particularly dangerous to humans. Filling water balloons at the base of the Leaning Tower. 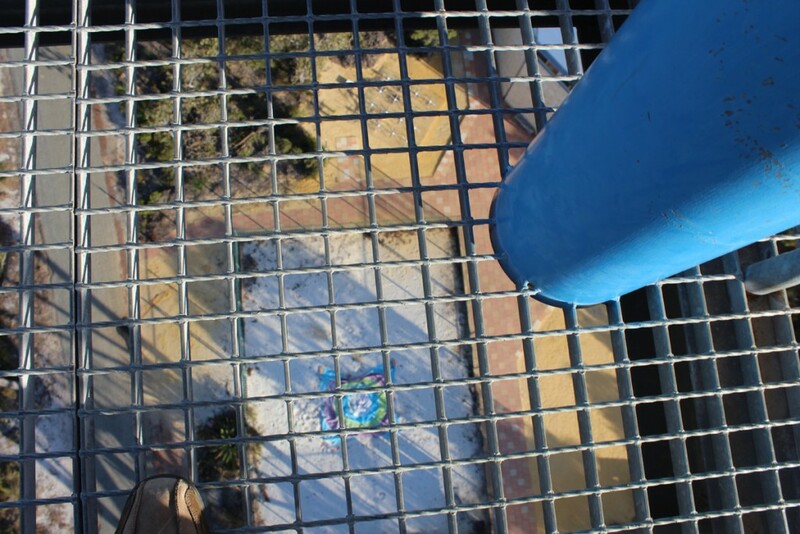 Looking down at the splash zone from 13 stories up. 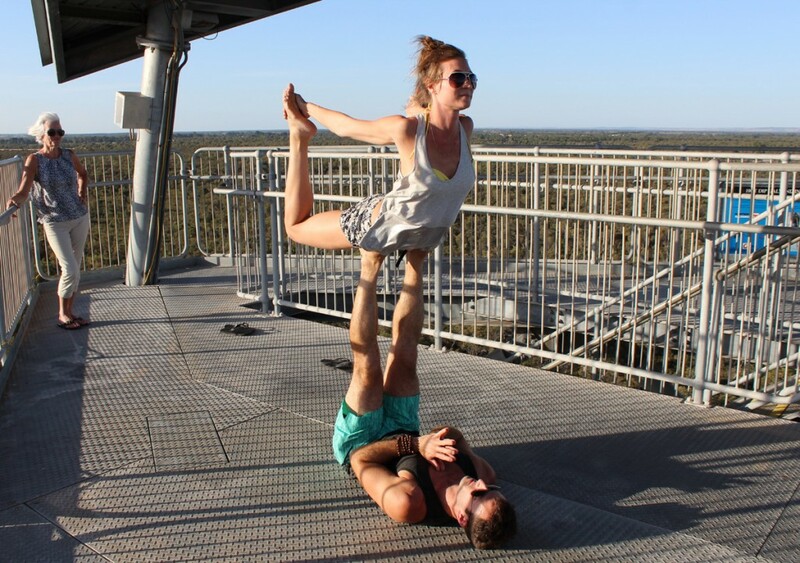 Sarah and Jamie striking a yoga pose on top of the Leaning Tower. 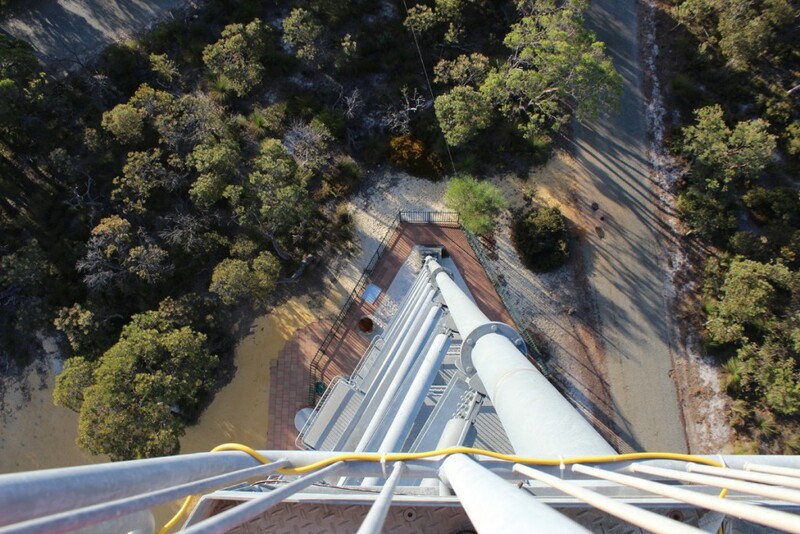 Looking straight down from the Leaning Tower of Gingin. 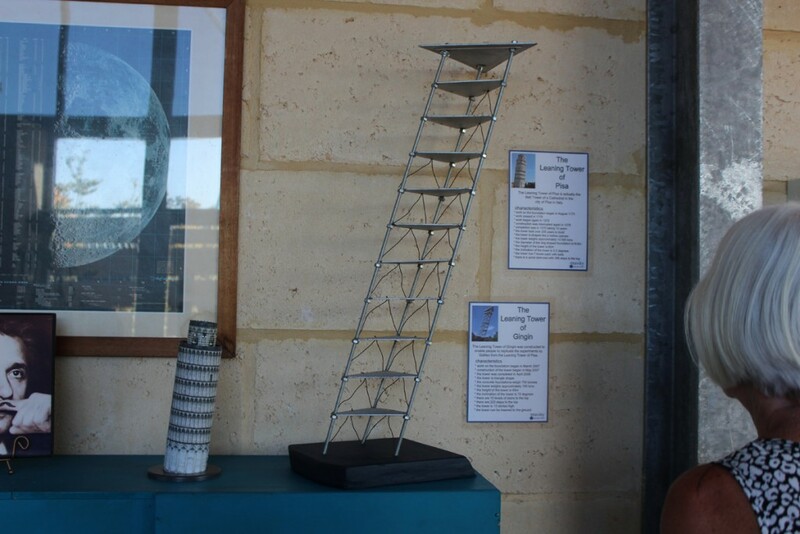 The Leaning Tower of Gingin – a last look.